Hope's Cafe: Evolution: The Grand Experiment Vol. 2-Living Fossils-Review! Evolution: The Grand Experiment Vol. 2-Living Fossils-Review! Every so often, a book comes along that I really enjoy, and earns a position on my top-10 (although there are more than 10 books) shelf next to my bed. Books that I will enjoy reading over and over, so I want them kept handy. Well, recently I added another one to that collection. Some of the books on my top-10 shelf! 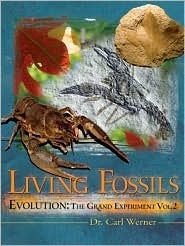 Just like the first book in the series, Living Fossils is loaded with detailed, full-color photos. This is nice for several reasons; first, because it gives me an idea of what the author is speaking about (and really proves his point throughout the book) but also because it will encourage even younger children to pick up the book. My brother, for example, will choose books to read based on the amount of color pictures in it! This one definitely passed his test. Before I share my thoughts about this book, I'd like to share a little background on the author and how the book came to be. Dr. Werner, during his medical school years, gradually became a staunch advocate of evolution. A year later, in his sophomore college term, Carl was out with a fellow-student. The other student gave Dr. Werner 4 questions-questions that changed his life. His final statement was "Carl, I challenge you to prove evolution". After this discussion, Carl decided to line up the evidence for both Creation and evolution, with the goal of proving evolution to be true. For the next 18 years, Dr. Werner studied the evolution debate in depth. After years of frustration, he decided to apply a test, taking the Creationist viewpoint in order to disprove it. If evolution was not true, then animals and plants should not change over time; thus Carl would be able to find "modern" plant and animal fossils in "older" rock layers. And that is how, in 1997, Dr. Werner and his wife began their trek that would come to total over 108,000 miles over 3 continents. Living Fossils is an amazing compilation from that journey. With over 15 chapters covering as many different species, Carl details how and where he found, in essence, living fossils! Fossils that appear to be exactly the same as modern animals and plants, yet were discovered in fossil layers supposedly millions of years old! For example, I was amazed at the pictures of the modern Ground Lizard, and a "Dinosaur-Era Lizard". They look exactly the same! And the same thing occurs over and over and over in this book! Picture on top of picture shows just how much plants and animals have really changed-or not! After reading this book, I honestly can not see how people can so blindly accept evolution, and not even care about the obvious discrepancies and problems with their belief! 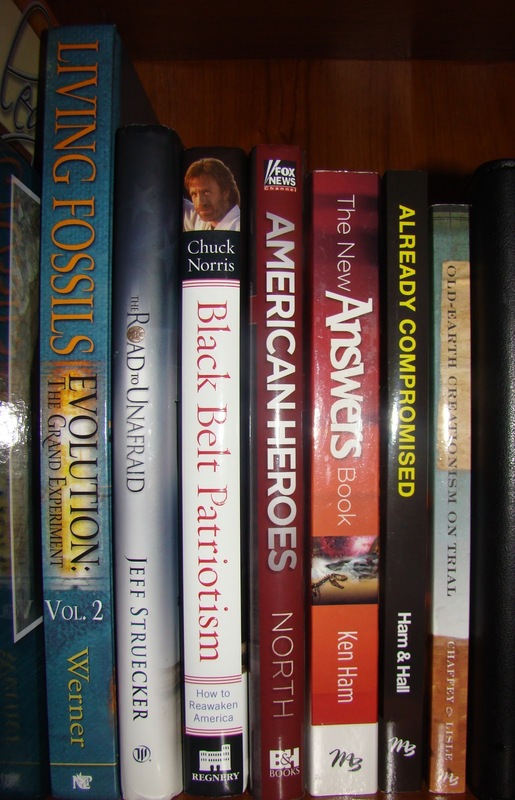 Dr. Werner has done an excellent job, and I am putting the first book, Evolution: The Grand Experiment, a top-priority purchase! Disclaimer: I was not monetarily compensated in any way for this review. I did receive a copy of the book for review from New Leaf Publishing Group.